This 6.5 ft. Square Shaped Patio Umbrella is designed for residential and commercial use offering lasting longevity with high quality materials. 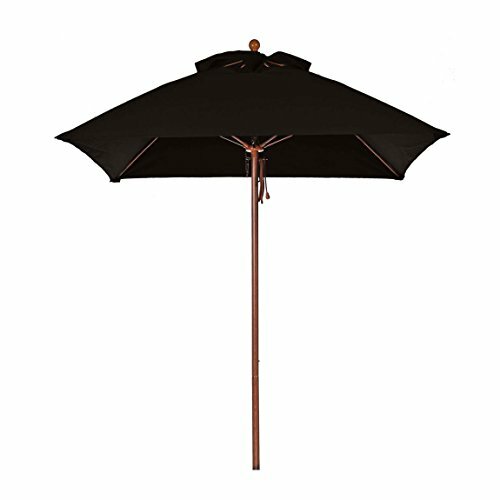 This umbrella shade features super durable 9-oz. solution-dyed marine grade fabric. This fabric provides you and your family exceptional protection from the sun. At 9 oz. it's much heavier than the standard 5 or 7 oz. fabrics used on other shades. This fabric is engineered for shade structures and features a very stiff, tight construction and a heavy finish. Solution-dying means the color is ingrained in every fiber, resulting in less chance of fading. 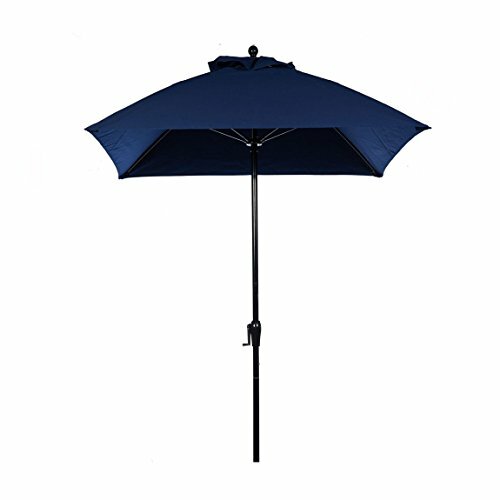 The umbrella is equipped with a pulley lift, non tilt. The 6.5 -foot umbrella offers ample shade, creating an oasis of cool for you and yours. Frame Color Options Available: Wood Grain, Bronze, Black, White and Silver Anodized. Boasting an enduring construction with 8mm dia. 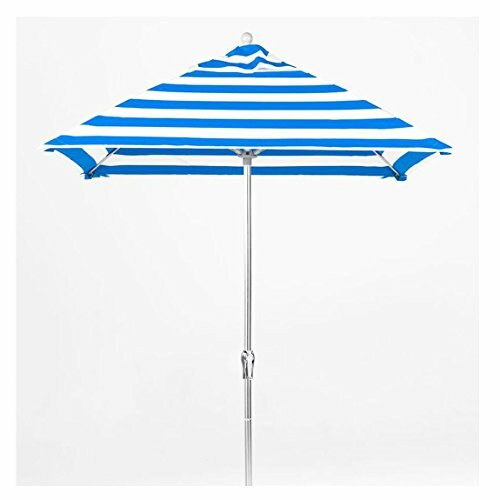 fiberglass ribs which are highly durable and will not crack or snap in windy condition, this umbrella offers expansive coverage with 6 tubing framework spanning 9 ft. The polyester offers UPF100+ solace from the sun due to unique additives to fabric, while a crank lift system allows for ease of use by turning the handle in clockwise direction to open and anti-clockwise to close canopy. Keep closed when not in use. 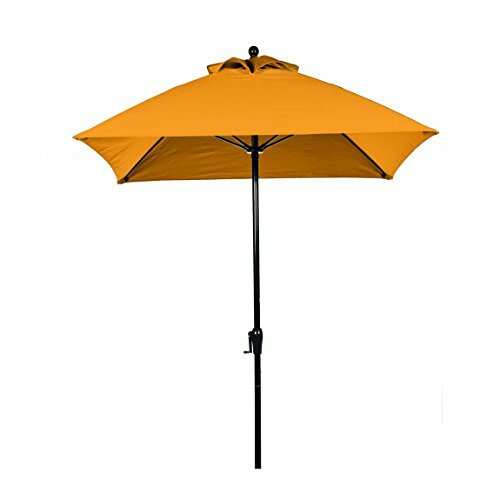 This 6.5 ft. Square Shaped Patio Umbrella is designed for residential and commercial use offering lasting longevity with high quality materials. 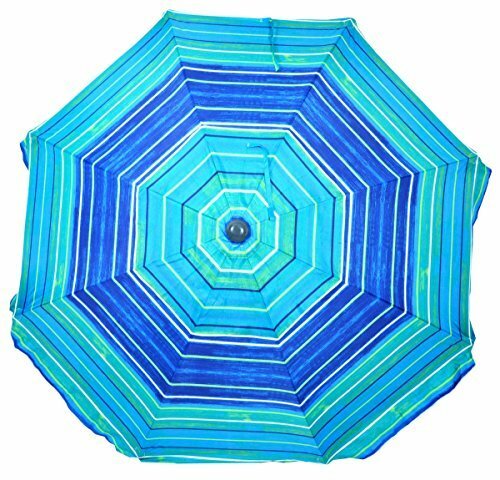 This umbrella shade features super durable 9-oz. solution-dyed marine grade fabric. This fabric provides you and your family exceptional protection from the sun. At 9 oz. it's much heavier than the standard 5 or 7 oz. fabrics used on other shades. This fabric is engineered for shade structures and features a very stiff, tight construction and a heavy finish. Solution-dying means the color is ingrained in every fiber, resulting in less chance of fading. The umbrella is equipped with a heavy gauge crank system. The 6.5 -foot umbrella offers ample shade, creating an oasis of cool for you and yours. Frame Color Options Available: Wood Grain, Bronze, Black, White and Silver Anodized. This 7.5 ft. Square Shaped Patio Umbrella is designed for residential and commercial use offering lasting longevity with high quality materials. This umbrella shade features super durable 9-oz. solution-dyed marine grade fabric. This fabric provides you and your family exceptional protection from the sun. At 9 oz. it's much heavier than the standard 5 or 7 oz. fabrics used on other shades. This fabric is engineered for shade structures and features a very stiff, tight construction and a heavy finish. Solution-dying means the color is ingrained in every fiber, resulting in less chance of fading. 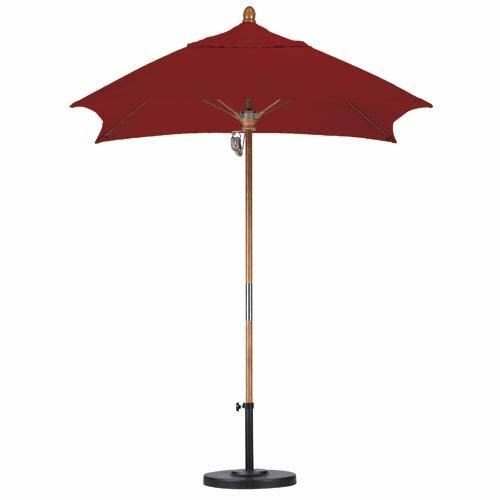 The umbrella is equipped with a heavy gauge crank system with auto tilt The 7.5 -foot umbrella offers ample shade, creating an oasis of cool for you and yours. Frame Color Options Available: Wood Grain, Bronze, Black, White and Silver Anodized. This 7.5 ft. Square Shaped Patio Umbrella is designed for residential and commercial use offering lasting longevity with high quality materials. This umbrella shade features super durable 9-oz. solution-dyed marine grade fabric. This fabric provides you and your family exceptional protection from the sun. At 9 oz. it's much heavier than the standard 5 or 7 oz. fabrics used on other shades. This fabric is engineered for shade structures and features a very stiff, tight construction and a heavy finish. Solution-dying means the color is ingrained in every fiber, resulting in less chance of fading. The umbrella is equipped with a heavy gauge crank system. 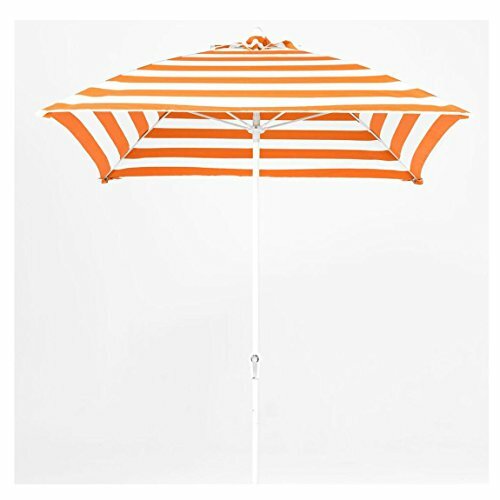 The 7.5 -foot umbrella offers ample shade, creating an oasis of cool for you and yours. Frame Color Options Available: Wood Grain, Bronze, Black, White and Silver Anodized. This 6.5 ft. Square Shaped Patio Umbrella is designed for residential and commercial use offering lasting longevity with high quality materials. This umbrella shade features super durable 9-oz. solution-dyed marine grade fabric. This fabric provides you and your family exceptional protection from the sun. At 9 oz. it's much heavier than the standard 5 or 7 oz. fabrics used on other shades. This fabric is engineered for shade structures and features a very stiff, tight construction and a heavy finish. Solution-dying means the color is ingrained in every fiber, resulting in less chance of fading. 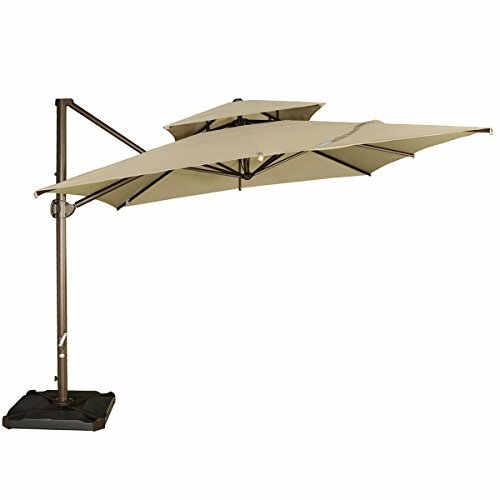 The umbrella is equipped with a heavy gauge crank system with auto tilt The 6.5 -foot umbrella offers ample shade, creating an oasis of cool for you and yours. Frame Color Options Available: Wood Grain, Bronze, Black, White and Silver Anodized. 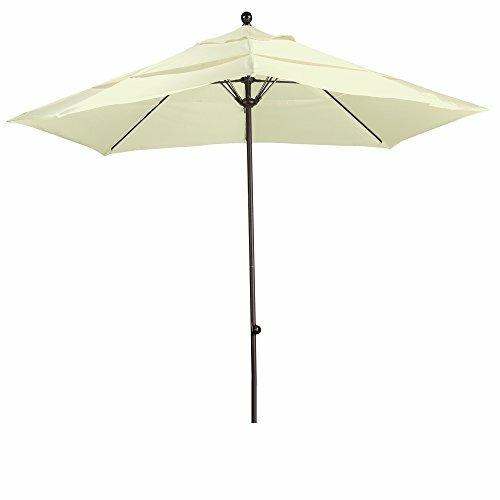 Looking for more Square Fiberglass Market Umbrella similar ideas? Try to explore these searches: Ferraz 600 Volt Fuses, Optra Laser Printer Cartridges, and Lever Polish.